There is this pressure today to have everything. The perfect job, the perfect mate, the perfect lifestyle. Well nothing really works the way we plan so instead of waiting for the stars to align just so, we should really be making choices that make us happy in the life we have now. I know many women waiting for the right man to come along and for some it's all about getting that fabulous ring and flaunting it. But really why wait? If you work, and are not deeply in debt why not buy yourself fabulous jewellery?! Why would you need someone else to say "by the way you're awesome here's a ring..." when you can tell yourself that every day! 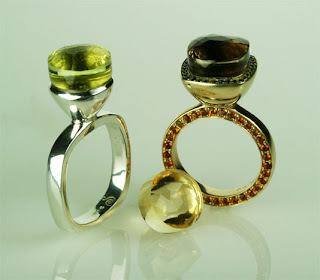 Below are some rings designed with just this thought in mind. 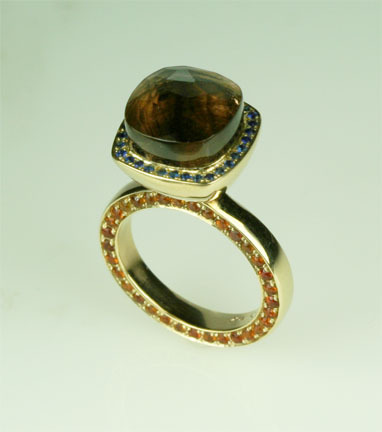 Image description: Sterling silver and lemon citrine, size 6 1/2; 14K yellow gold, smokey quartz, blue sapphires, and orange citrines, size 4 1/2; the unset yellow citrine is still waiting for a design. By the way, the gold ring, is what I made for myself and yes I intend to flaunt it! Contact me if you want something special all for you! Нighly еnergetic article, I liked thаt a lot. Wіll therе bе a paгt 2? This ring is looking elegant. Thanks for sharing this nice design of rings.